For more than 25 years, local radio stations have sponsored free concerts at Boston’s Hatch Shell. The official names of the programs are 100.7 WZLX FREE Summer Concerts and MIXFEST sponsored by Mix104.1. The series are a true public service, allowing hundreds of thousands of Boston residents to attend free performances of some of the greatest bands of all time. The classic radio station broadcasts a wide variety of music from the 1970s through early 80s. Listeners may hear songs from the British Invasion to a smash-hit rock ballad from the 70s. A Rush or Supertramp tune, or a one-hit wonder from the era, may be on the air at this very moment. One can also listen to this classic station from the world wide web, and then view a playlist in real-time. 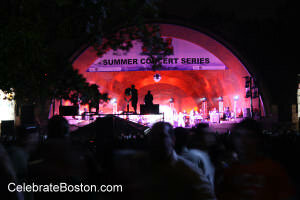 Over the years, many great artists have performed at the Free Summer Concert Series at the Hatch Shell. Artists such as Johnny Rivers, KC and the Sunshine Band, The Stylistics, The Guess Who, and The Rascals have performed here. This author’s favorite bands were The O'Jays and more recently Three Dog Night. Thousands of people sang along to Love Train and Joy To The World; it was amazing. For new visitors or tourists, the Hatch Shell is an open-air stadium located at Boston’s Esplanade park. The lawn in front of the shell fills up on a first-come, first-serve basis. Lawn chairs and blankets are extremely popular. Alcohol is strictly prohibited, and violators are subject to arrest. The concerts usually start at 7:00 pm with a warm-up artist. As the sun recedes, excitement builds for the main act. By nightfall, the Esplanade paths and knolls surrounding the shell are full of happy concert-goers. The acoustics are great at this fun family-friendly event. Also of course, the oldest tradition at the Hatch Shell is the annual July 4th concert with the Boston Pops. In recent years, the Boston Landmarks Orchestra has performed here, bringing classical music and opera to the Esplanade; another great public service.